When Christina Cabrera transferred into the University of Virginia as a third-year student in 2015, she was asked if she wanted to sign onto the student meal plan. Not quite. Cabrera was a 23-year-old “non-traditional” student who was planning to commute to her classes from home. She already had a world of experiences, as well as a two-year associate’s degree from Thomas Nelson Community College. Today, the Yorktown native is married, has a nearly full-time job with a Charlottesville biotech company, owns a home, has a dog – and will graduate in May with a bachelor’s degree in biomedical engineering. Though she came from a family of engineers – including her father and her sister – she was initially uninterested in the profession. In fact, when she graduated from high school, she admits she “wasn’t ready for college” and wasn’t sure what she wanted to do. So she went to Honduras to volunteer at an orphanage and teach English to elementary school students. “I wanted to get a new experience, and figure out what I wanted to do,” Cabrera said. She returned to Yorktown, enrolled at the community college, earned her associate’s degree and entered UVA. 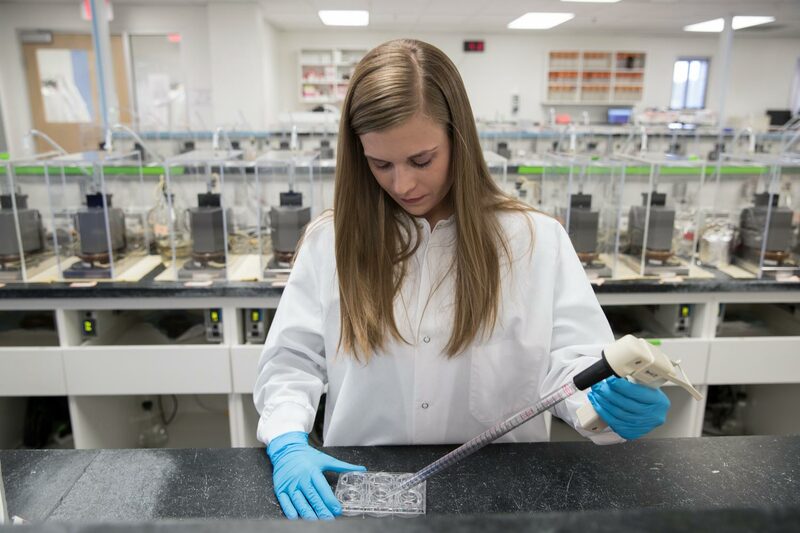 After her first year as a biomedical engineering major, she landed a summer internship at HemoShear Therapeutics, a successful drug-discovery company founded by former UVA Engineering School and Department of Medicine faculty members Brett Blackman and Brian Wamhoff, respectively, as a spin-off from technologies developed in UVA labs. Cabrera found her calling while testing potential new drugs to treat devastating childhood liver diseases. She has remained at HemoShear for two years now, working 20 to 30 hours per week while studying full-time at UVA. She said her coursework and the technical training she has gained on the job have prepared her well for a career in biotechnology. Upon graduation, she will become a full-time employee at HemoShear, and receive a promotion. Simmers, by the way, is a “double ’Hoo” with two degrees in biomedical engineering, having earned his bachelor’s in 2005 and Ph.D. in 2010. He said the Engineering School does a great job of preparing graduates, such as Cabrera, with a breadth of knowledge and technical skills for the professional business world. Cabrera’s fourth-year thesis and capstone project, involving drug discovery, are directly tied to the research she is doing on the job. As a slightly older student, Cabrera said she has in some ways missed the social experience of traditional students, but that she has a satisfying social life with her colleagues at HemoShear, some of whom are UVA grads. Additionally, many of her professors have some association with the company. “I think in class, my fellow students see me more as an older sibling than a classmate,” she said. Her fourth-year thesis advisor, Rider Foley, an assistant professor in the Department of Engineering and Society, said Cabrera improves the dynamics in the classroom. Skills Cabrera takes to work every day.